The Universe is permeated by hot, turbulent, magnetized plasmas. Turbulent plasma is a major constituent of active galactic nuclei, supernova remnants, the intergalactic and interstellar medium, the solar corona, the solar wind and the Earth’s magnetosphere, just to mention a few examples. Energy dissipation of turbulent fluctuations plays a key role in plasma heating and energization, yet we still do not understand the underlying physical mechanisms involved. THOR is a mission designed to answer the questions of how turbulent plasma is heated and particles accelerated, how the dissipated energy is partitioned and how dissipation operates in different regimes of turbulence. THOR is a single-spacecraft mission with an orbit tuned to maximize data return from regions in near-Earth space – magnetosheath, shock, foreshock and pristine solar wind – featuring different kinds of turbulence. 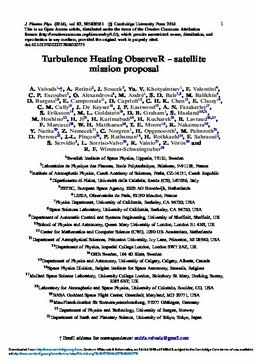 Here we summarize the THOR proposal submitted on 15 January 2015 to the ‘Call for a Medium-size mission opportunity in ESAs Science Programme for a launch in 2025 (M4)’. THOR has been selected by European Space Agency (ESA) for the study phase.